As Music By Numbers get's ready to roll into night Number 3 we thought we'd warm you up with some remixes courtesy of special guest Foamo. We've not yet managed to catch him doing his thing so really looking forwards to this. 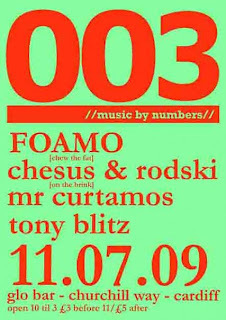 Posted in Cardiff, chesus, foamo, glo bar, mr curtamos, music by numbers, rodski . Bookmark the permalink. RSS feed for this post.